乔志刚, 张晓光, 沈方方, 刘淑琰, 贾武. 大口黑鲈精子超微结构研究[J]. 四川动物, 2017, 36(6): 686-690. QIAO Zhigang, ZHANG Xiaoguang, SHEN Fangfang, LIU Shuyan, JIA Wu. Studies on the Micro-ultrastructure of Micropterus salmoides Sperm[J]. Sichuan Journal of Zoology, 2017, 36(6): 686-690. Abstract: The current study investigated the ultrastructure of largemouth bass (Micropterus salmoides) sperm using scanning electron microscope and transmission electron microscope. The sperm of M. salmoides was composed of three major parts:a nearly spherical head without an acrosome, a unconspicuous midpiece, and a slender flagellum. The full-length of sperm is 25.07 μm±4.93 μm (n=30) with a spherical head length of 1.73 μm±0.29 μm in diameter (n=30) and a slender flagellum length of 23.00 μm±4.86 μm long (n=30). The head of sperm is mainly composed of a mushroom-shaped nuclei, and the clustering electron-dense is separated by an electronlucent area. The nucleus near the flagellum segment is a depression, and it forms shallow nuclear fossa. The midpiece of sperm contains the centriolar complex and the sleeve. The centriolar complex is composed of the proximal and distal centriole. The proximal centriole is located inside the nuclear fossa and parallel to the cross axis of nuclei. The 'T' shape distal centriole locates outside the nuclear fossa and inside the sleeve is the base of flagellum, and it is perpendicular to the proximal centriole. There are 17±4 unequally sized mitochondria (n=30) inside the central space of both sides of sleeve. The flagellum of sperm stretched out of the central space of sleeve is mainly composed of the axoneme and the lateral fin. The axoneme comprised microtubule configurations in a '9+2' microtubule pattern. The lateral fins are distributed on both sides of flagella. These results revealed that the sperm of M. salmoides should be categorized as Type Ⅰ, which is clearly distinct from the sperm of other species from order Perciformes in the shape of sleeve, the number and shape of mitochondria. The sleeve structure of M. salmoides is accord with the typical sleeve structure of teleost sperm, but the shape and the number of mitochondria of M. salmoides are similar with amphibian species, indicating that M. salmoides is more original in phylogenetic development than other species of Perciformes. 图版Ⅰ 大口黑鲈精子超微结构 PlateⅠ The ultrastructure of sperm of Micropterus salmoides 1.扫描电镜下大口黑鲈精子结构，比例尺=5 μm；2.精子头部横切，比例尺=1 μm；3.未成熟精子纵切，比例尺=1 μm；4.成熟精子纵切，比例尺=1 μm；5.精子中段横切，比例尺=500 nm；6.精子中段纵切，比例尺=1 μm；7.精子中段纵切，比例尺=500 nm；8.精子鞭毛纵切，比例尺=1 μm；9.精子鞭毛横切，比例尺=500 nm；AX.轴丝，CS.袖套腔，DC.远端中心粒，E.电子透明区，F.鞭毛，H.头部，La.侧鳍，M.线粒体，MP.中段，MT.微管，N.细胞核，PC.近端中心粒，V.囊泡。	1. sperm under SEM, scale bar=5 μm; 2. cross section of the head, scale bar=1 μm; 3. longitudinal section of the immature sperm, scale bar=1 μm; 4. longitudinal section of the mature sperm, scale bar=1 μm; 5. cross section of the midpiece of the sperm, scale bar=500 nm; 6. longitudinal section of the midpiece, scale bar=1 μm; 7. longitudinal section of the midpiece, scale bar=500 nm; 8. longitudinal section of the sperm flagellum, scale bar= 1 μm; 9. cross section of the sperm flagellum, scale bar=500 nm; AX. axoneme, CS. central space of the sleeve, DC. distal centriole, E. electron lucent area, F. flagellum, H. head, La. lateral fin, M. mitochondrion, MP. midpiece, MT. microtubule, N. nucleus, PC. proximal centriole, V. vesicle. 陈乃松, 马建忠, 周恒永, 等. 2010. 大口黑鲈对饲料中蛋氨酸需求量的评定[J]. 水产学报, 34(8): 1244–1253. 樊佳佳, 白俊杰, 李小慧, 等. 2009. 大口黑鲈生长性状的微卫星DNA标记筛选[J]. 遗传, 31(5): 515–522. 胡谋, 苗亮, 李明云, 等. 2014. 黄姑鱼(Nibea albiflora)与大黄鱼(Pseudosciaena crocea)精子超微结构的观察与比较[J]. 生物学杂志, 31(2): 1–4. 李镕, 白俊杰, 李胜杰, 等. 2011. 大口黑鲈生长性状的遗传参数和育种值估计[J]. 中国水产科学, 18(4): 766–773. 杨万喜, 应雪萍, 竺俊全, 等. 2000. 硬骨鱼类精子发生及其在系统演化研究中的应用前景[J]. 东海海洋, 18(3): 53–58. 尤永隆, 林丹军. 1996. 鲤鱼精子超微结构的研究[J]. 动物学研究, 17(4): 377–383. Baccetti B, Burrini AG, Collodel G, et al. 1987. On the undulating membranes of spermatozoa in some teleosts[J]. Acta Embryologiae et Morphologiae Experimentalis, 8: 215–221. García-Díaz MM, Lorenti MJ, Gonzalez JA, et al. 1999. Comparative ultrastructure of spermatozoa of three marine teleosts of the genus Serranus:Serranus atricauda, Serranus cabrilla and Serranus scriba[J]. Journal of Submicroscopic Cytology and Pathology, 31(4): 503–508. Jamieson BGM. 1991. Fish evolution and systematics:evidence from spermatozoa[M]. Cambridge: Cambridge University Press. Lahnsteiner F, Patzner RA. 1995. Fine structure of spermatozoa of two marine teleost fishes, the red mullet, Mullus barbatus(Mullidae)and the white sea bream, Diplodus sargus (Sparidae)[J]. Journal of submicroscopic Cytology and Pathology, 27(2): 259–266. Lahnsteiner F, Patzner RA. 2008. Fish spermatology[M]. Oxford: Alpha Science Ltd.
Mattei X. 1970. Spermiogeneses comparee des poisons[M]. New York: Academic Press, Inc: 57-69. Quagio-Grassiotto I, Gameiro MC, Schneider T, et al. 2003. 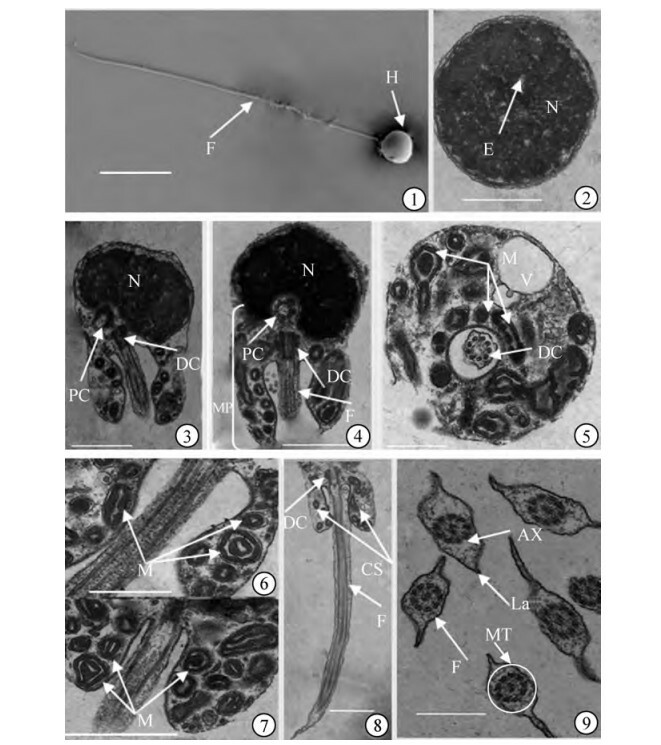 Spermiogenesis and spermatozoa ultrastructure in five species of the Curimatidae with some considerations on spermatozoa ultrastructure in Characiformes[J]. Neotropical Ichthyology, 1(1): 135–145.